A Beautiful Late Victorian Painted Watnot. A beautiful late Victorian era bamboo watnot with 2 small mirrors to back. Very much in the chinoiserie taste. Painted a blue green colour. The paint is fairly old too, not sure if original to the piece but certainly has age crackling all over. 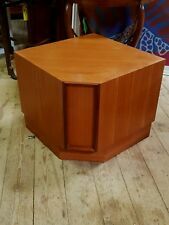 A G Plan corner unit base in teak ideal for a TV stand. Would have had a top section with shelves etc but these are useful as stylish TV stands and being a corner unit could be ideal. Stylish and sought after piece, good luck. 19th Century bamboo corner shelf from France, made with tortoise bamboo. It has two accent mirrors in the top and three shelves which are done in chinoiserie. The Compass Project 2012 is a social enterprise founded and operated entirely by people in recovery from addiction.